To build a strong network of wrestling supporters with national influence. To establish a strong community of alumni that serves and promotes the sport of wrestling and the mission of the NCWA. To build the notoriety of the NCWA by increasing attendance at national and local events. To help member institutions promote and build their local alumni associations. To produce philanthropic income to the NCWA in order sustain growth and improvement. To build camaraderie between current and former NCWA wrestlers. To celebrate outstanding wrestling commitment and service through the NCWA Hall of Fame. NCWA Mission Statement"Dedicated to Expanding Athletic Opportunity to Tomorrow's Leaders"
The NCWA was created to fill a gap in today's wrestling community. Many institutions have lost their NCAA wrestling programs (see: Lost Programs) due to outside influences such as budgetary cutbacks or governmental legislation. Although participation interest among students remains high, many schools have been forced to offer their students fewer opportunities. The NCWA has stepped in to help provide this opportunity to the increasing number of high school seniors searching for continued wrestling competition in college. Despite the fact that wrestling is the fastest growing male interscholastic sport, colleges and universities have been unable to offer wrestling opportunities for these incoming students within their athletic departments. The NCWA helps to build programs under the student services or recreational sports departments of universities. We provide a national governing body for competition, communication and promotion of collegiate style wrestling. 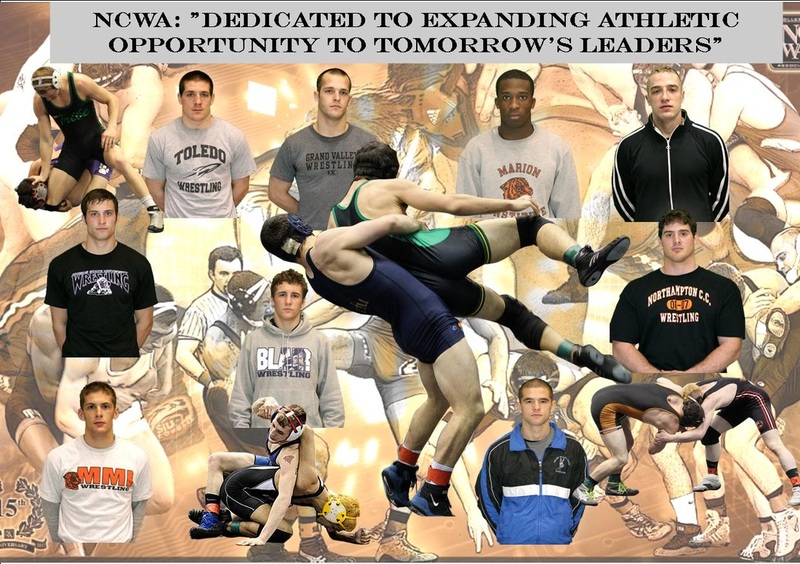 The NCWA is committed to a vision that has at its core increased athletic opportunity for all students. We hope to provide a spawning ground for new wrestling teams. Teams that draw students who will chose an institution of higher education for its academic excellence. With college wrestling at its most limited level in history, and more wrestling athletes graduating from high school, many wrestlers are left to choose between continuing the sport they love and their first academic choice for schooling. The NCWA is designed to help solve this challenge. Since the university is not adding members to its athletic department, but rather to its club sports department, it can properly balance opportunity ratios, and because NCWA teams are primarily funded by students themselves and outside community resources, there are no university budgetary concerns. If and when a school does have room for athletic expansion, it is our hope that since the wrestling program will be up and running, and in compliance with NCAA rules, that it will be a first choice for ultimate inclusion in the schools athletic curriculum. The NCWA was founded with the student athlete in mind. We are composed of non-paid volunteers committed to helping our young people accomplish their goals and dreams, and to reach for excellence in everything they do. Through athletic endeavor, club leadership responsibilities and community involvement, NCWA students will leave college life to meet a competitive world head on. They will have been equipped through their academic involvement and athletic success to take the competition to the mat, score and emerge a champion. We encourage you to take the next step in expanding the way your school sees student involvement in athletics. Join us in changing lives.